Oil industry equipment maker raises quarterly payout to $0.26..
Oil industry equipment manufacturer National Oilwell Varco (NYSE:NOV) will pay a second-quarter dividend of $0.26 per share, double the $0.13 per share it paid last quarter, the company announced today. The board of directors said the quarterly dividend is payable on June 28 to the holders of record at the close of business on June 14. National Oilwell Chairman and CEO Pete Miller said: "This dividend increase reflects the Company's strong financial condition and our confidence in our business going forward. We are pleased that our continued execution and strong cash flow enable us to provide a significantly higher dividend directly to our stockholders. Our business model continues to generate strong operating cash flow that enables us to invest in and execute strategic internal growth and pursue acquisition opportunities to further strengthen our existing businesses." 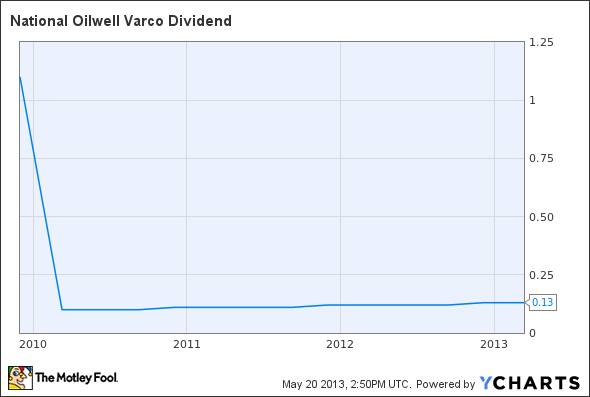 The regular dividend payment equates to a $1.04-per-share annual dividend, yielding 1.5% based on the closing price of National Oilwell Varco's stock on May 17. NOV Dividend data by YCharts. Chart does not reflect latest dividend increase.